Offering you a complete choice of products which include pharmaceutical probiotic sachets. Highly acknowledged for its quality, our company is engaged in offering a vast array of Pharmaceutical Probiotic Sachets which is used in the treatment of various disease, our vendor uses an only high-grade chemical compound like Thiocolchicoside, and other related chemical compounds to formulate these Pharmaceutical Sachets tablets so as to maintain set medical norms. 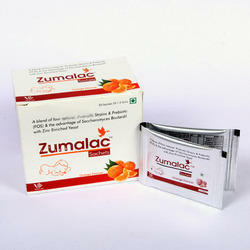 The quality of these pharmaceutical Sachets tablets is assured by checking completely against several parameters. Along with that, the offered Pharmaceutical Sachets tablets are broadly recommended in hospitals, clinics, nursing homes and other medical sectors.